Your Tourer / Motorhome has a [three/six/twelve] month warranty valid from the date of purchase as shown on your invoice. The warranty is not transferable. We have thoroughly inspected your Tourer / Motorhome before handover to you and have rectified any defects noted at the time. You should maintain and service your Tourer / Motorhome in line with the manufacturer's recommendations. In the event of any warranty claim, the Tourer / Motorhome must be inspected and repaired in our workshop unless otherwise agreed by us. We will not accept liability for any associated travelling or other costs. This warranty is in addition to any residual warranty cover for the Tourer / Motorhome that may still be available from the manufacturer (subject to compliance with the manufacturer's warranty terms and conditions). We will repair (or at our discretion, replace) any defects in parts, fittings or body structure that arise within the warranty period (even if not detected within that period). If original parts are unavailable, appropriate replacements will be used. Defects arising from normal wear and tear commensurate with the proper use of the Tourer / Motorhome. Defects caused by inappropriate use or as a result of storm, flood, frost, accident or breakdown. Defects caused as a result of a lack of proper maintenance (e.g. failure to winterise/drain down). Water ingress caused by the use of pressure washers or inappropriate cleaning machinery. Defects arising from any repairs carried out by the purchaser or a third party. Any item not fitted as part of the manufacturer's original specification. Any item subject to normal wear and tear, including, but not limited to: curtains, cushions, carpets, upholstery, work surfaces, glass, paintwork, tyres, tubes, batteries, gas bottles, bulbs, LEDs, fuses, entertainment systems. If you find a defect which you believe is covered by this warranty please contact us at the address below as soon as possible with details of the defect. This warranty does not affect and cannot exclude any of your statutory rights as a consumer. For more information on these statutory rights contact a local authority Trading Standards Department or Citizens Advice Bureau. 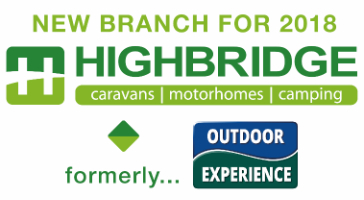 Highbridge Caravan Centre. Aftersales Department.